Forty years ago,if a woman wanted to go for a jog,it could be a very awkward and even painful experience. The reason? She was likely running in a regular bra with slipping straps, chafing seams, and…let’s face it…uncomfortable bouncing! Women’s workout apparel has come a long way since then, and modern bra researchers are looking for even better ways to support women’s breasts during exercise. They are learning that improvements in bra technology help with comfort, but also allow many developing teens to stick with sports and live healthier lifestyles. Read on to find out how a simple ‘jock strap for women’ is influencing women’s athletics across the world. Love history? Learn about the Bizarre 2,000 Year History of the Treadmill. According to ScienceDaily.com, more than half of all women experience breast pain while exercising. Whether they are jogging, playing a team sport, riding a horse, or doing yoga, breasts need support during motion. For many large breasted teens, puberty marks the end of their active play and the start of embarrassment, pain, and inactivity. Girls avoid running around because they do not have the proper undergarments to keep their breasts from bouncing all around. Renelle Braaton, the Enell Inc. bra designer for large-busted women, believes that a properly supportive bra enhances athletic performance and allows women to concentrate on their sport instead of worrying about their appearance. Since October is Breast Cancer Awareness Month, this seemed like a great opportunity to focus on women’s bras and how they can help change women’s athletics. Before we look at how modern day bras are influencing women, let’s travel back in time and see how our predecessors dealt with their bouncing bosoms. 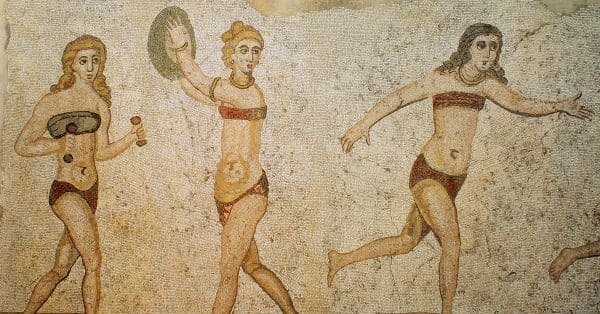 Roman mosaics from 300 AD show women participating in sports with fabric binding their chests. In 1906, American inventor Laura Blanche Lyon created the patented bust supported. This was a canvas camisole that fastened in the back with gathered cups. It is considered by many to be the very first sports bra. Later, in 1917, Ethel Quirk created another breast supporter for theatrical acrobatic dancing. Still, women’s breasts got in the way. French athlete, Violette Morris, even had an elective mastectomy in the 1920’s because her breasts impeded control of her racecar! The invention story of the first modern sports bra is even more bizarre. In the 1970’s, jogging was just starting to become popular and women across the country were taking to the trails. They ran in regular lingerie style bras, which resulted in slipping straps, chafed skin, and very uncomfortable breasts. This unsupported bouncing not only resulted in sore breasts but also damaged the ligaments that support breast tissue resulting in premature sagging and other health problems. In 1977, Lisa Lindahl, an avid runner, was on the phone with her friend Victoria Woodrow. “What do you do for a bra,” asked Victoria. “All that flopping about, it’s hardly comfortable.” When Lisa joking replied that there should be a jock strap for women the two ladies had a good laugh. After Lisa hung up, she paused and realized that this was actually a pretty good idea! With more consideration, she decided a great sports bra should have no sharp hardware, minimize breast bounce, and have straps that didn’t fall down. She brought on costume designer Polly Smith to create a few prototypes. They were having trouble nailing down the design when something brilliant happened. Lisa’s husband strapped two male jockstraps to his chest and paraded around the living room. The ladies took notice. 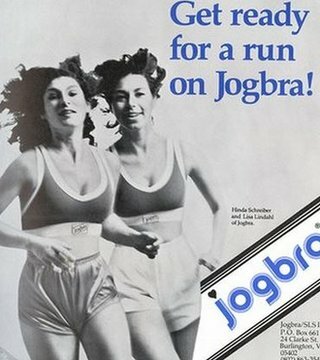 After some creative sewing, the first JogBra was born. The first modern sports bra was simply two male jock straps sewn together in 1977. Photo Credit. Over the years, the sports bras have undergone many changes and scientific improvements. There are three main types on the market. A compression bra squishes the breasts against your chest wall creating the familiar “uniboob” effect. An encapsulation sports bra has two separate cups, which lift and separate the breasts. This bra type is more supportive for larger cup sizes, but they also tend to be less comfortable. Finally, a combination bra exists which is a mixture of the two styles. Sports bras are designed to help women feel comfortable and confident while they exercise, but not all women choose to take advantage. The University of Portsmouth found that the majority of women who exercise don’t bother to wear a sports bra despite the risk of breast damage, pain, and accelerated sagging. The JogBra has evolved into many new styles and designs based on scientific studies. Photo Credit. For many young women, this lack of a properly fitting sports bra prevents them from participating in sports all together. Another questionnaire issued by the university found that 46% of the 2,000 girls surveyed found that their breasts were barriers to participating in sports. Renelle believes that young girls tend to quit sports when their breasts develop because they are too embarrassed and self-conscious to participate. “They just won’t go through the humiliation of playing basketball in front of their peers if they’re bouncing all over the place,” Renelle says. Sports bras have helped get more adolescent girls into sports and helped effect the development of sports programs for women. Amanda Brasher from the university’s Research Group in Breast Health stated, “There’s a need to educate girls and empower them to make the right choices about their breast health, whether that’s to do with wearing the correct sports bra or how to choose that sports bra.” She goes on to claim that a sports bra is as important as your footwear and you should replace them as often as you replace your shoes. Researchers from England’s University of Portsmouth found that while a woman is in motion her breasts actually “arc through a complicated figure-8 pattern.” This means that bras need to do more than just limit up and down movement. In a different study they found that inadequate breast support is more than just uncomfortable. It can also be harmful. When women were observed running without proper support, their running stride was affected such that they landed more heavily on the inside of their feet. This put them at risk for stress-related injuries. Two modern style sports bras are shown next to the original JogBra. Most women wear compression bras that simply squash their breasts against their chest. These bras work well to limit the in-and-out movement of the breasts but not the side-to-side motion, which can strain the Cooper’s ligaments. These ligaments are the connective tissue that keeps breasts perky. They limit the up and down motion of breast bounce but are rated as the least comfortable sports bra. Comfort is certainly an important factor to consider so newer designs are constantly being proposed. A recent study from the University of Wollongong in Australia concluded that an even better solution exists apart from the compression and encapsulated bras. This would be especially important for women who were D-cup bras or lager. This article was published in the journal Medicine & Science in Sports & Exercise. A new experimental bra combined the compression of the bosom with elevation of each individual breast with small foam pads tucked into the bra. This is different than a compression and encapsulation hybrid. Instead, the breasts remain uncapped but were held up slightly by the internal pads. This type of bra was extremely comfortable and also did a better job of limiting motion up and down, and side to side. It’s more important than ever to help educate women on the value and proper fitting of sports bras. The obesity epidemic in our country has resulted in many younger girls with larger chests that cause embarrassment during exercise. Ten years ago, a 34B was the average breast size, but today that number has increased to a 38C. Sports apparel companies are doing more to focus on these big-breasted athletes, which means that consumers have more options than ever. A properly fitting sports bra could help these young girls exercise with out pain or embarrassment so they are more likely to continue with an active lifestyle. Should we consider a sports bra a modern marvel of our day? Since it allows women to exercise without pain or embarrassment, I would argue “Yes!” They have come a long way since Lisa Lindahl first stitched two jock straps together. Today, they are essential for all woman athletes so they can focus on their sport and not on their bosoms! What is your favorite kind of sports bra? Can you share stories of being a developing teen playing sports? To learn more about the fight against breast cancer, visit The American Cancer society webpage.